Today humans are busier than ever. We don’t have time and energy for all of the things we used to be able to do. And our lifestyles are only getting busier. This means that your pets are missing out on quality time with you. It isn’t easy for the 21st century pet, but the Anthouse Robot Pet Companion is here to improve your pet’s life. The idea is that owners can “telesocialize” with their pet via an Internet connection. You miss your dog and your dog misses you, so this provides a way to connect and not leave your pet completely unattended. This robot is controlled with the accompanying app for iOS or Android and connects through your home WiFi network to let you see your pet in real-time. You can take photos, videos and communicate using the built-in speaker. Your pet will love that you are able to check in. 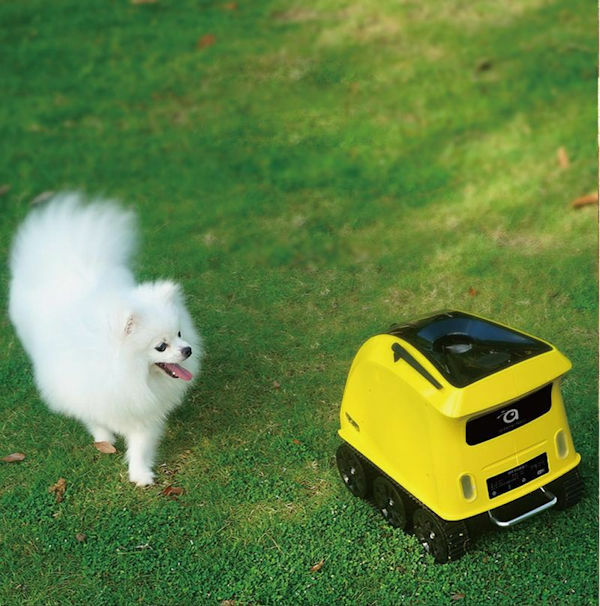 You can even use the robot to play with your pet, because it is capable of launch projectiles like tennis balls. Your dog can bring them back to the robot and drop them in a chute on top, so that they can be shot out again. It also feeds treats! No need to feel bad about your busy lifestyle any longer. You and your pet can be best buds again.